Fits all trucks, vans, SUVs and sedans with fold-down seats or bench seats. Sueded microvelvet fabric repels pet hair, dirt and moisture. Elastic straps and metal hooks at sides ensure secure fit. Seat cushion filled with "high-memory" fibre for added comfort and protection. Bottom cushion "tufted" to prevent fibre from clumping or shifting. FABRIC: Sueded microvelvet with attractive contrast binding. INNER FILLER: 2" of "High-Memory" polyester fibre. SIZES: Back: 57"x30" Seat: 57"x19"
Colors Available: Camoflauge (ebony), Cocoa (cashew trim), Granite (onyx trim), Mushroom (suede bone trim), Onyx (granite trim), Slate Blue (granite trim) Please specify color upon checkout. Fits all trucks, vans, and SUVs and sedans with bucket seats. 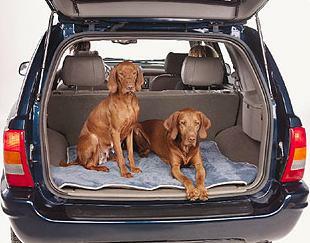 Sueded microvelvet fabric repels pet hair, dirt and moisture. Elastic straps ensure secure fit. 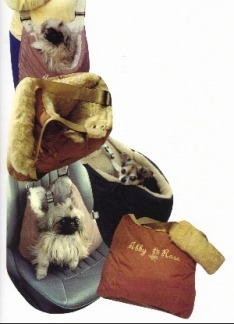 Seat cushion filled with "high-memory" fibre for added comfort and protection. SIZES: Back: 23.5"x24" Seat: 21.5"x20"
Contoured to fit the rear cargo area of mid-size S.U.V.s such as: Cherokee, Jimmy, Explorer, Pathfinder, Durango, 4-Runner. 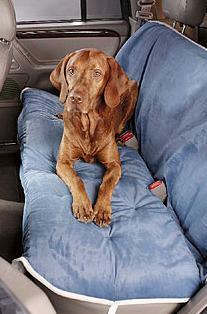 Sueded microvelvet fabric repels pet hair, dirt and moisture. Quilted with 2" of Dacron fibre for superior comfort and protection. Diamond quilting prevents fibre-fill from shifting or clumping. FABRIC: Two-tone (back and front) sueded microvelvet with attractive contrast binding. INNER FILLER: 2" of "High-Memory" polyester fibre quilting. Colors Available: Cashew & Cashew, Cocoa & Bone, Onyx & Granite, Slate Blue & Granite, Camouglauge & Black. Please specify color upon checkout. 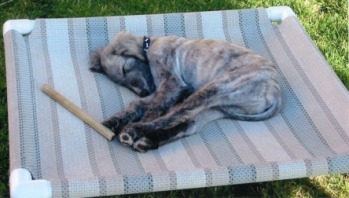 Baby Dillion.... puppy dreaming on his wonderful pet lounger. Pet Lounger sits up off the ground keeping doggies clean and cool. No dirt and wet grass to bother him. Just like Mom and Dad's patio lounger. Washable nylon mesh and PV frame. Designs vary from square to rectangle. Rectangle 25 x 52 x 65 and Square 32 x 36. Reversible waterproof roll. Indian polar fleece with water resistant cordura on the underside. Size 60 x 60. 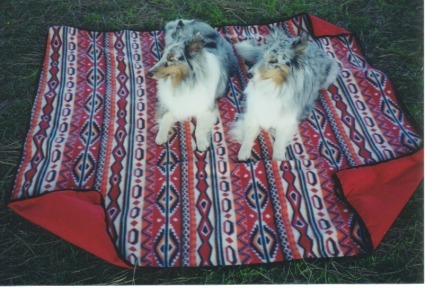 Casey and Catch enjoy relaxing on their "Park Roll" between their Agility Classes. 2. 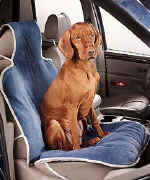 Pet safety belt in your car-shoulder strap goes over headrest and pet sits in place. 3. Pet pouch for biking. 4. Pet backpack for hiking. 5. Pet pouch while shopping. 6. 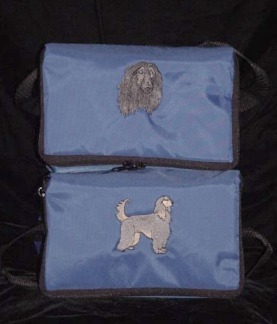 Purse-for all the "essentials"
Six Pack Cooler Bag with your breed of dog. Colors available: Red or Royal.